Education that is outcome-based is a learner-centered, results-oriented system founded on the belief that all individuals can learn. What is to be learned is clearly identified. Learners’ progress is based on demonstrated achievement. Multiple instructional and assessment strategies are available to meet the needs of each learner. Time and assistance are provided for each learner to reach maximum potential. In other words, the specific skills that are needed for success in the workplace can be identified, and learning strategies can be selected for the acquisition of these skills. [A] leader’s primary role [is] that of a teacher: if you are not teaching, you are not leading. In a teaching organization, everyone teaches, everyone learns, and everyone gets smarter everyday….Being a teacher also means being a learner. It isn’t only that you learn first and then teach, but that you learn through teaching. Based on these perspectives, it can be argued that having students learn through teaching (i.e., the sharing of what they have learned) is a promising approach for preparing students to succeed in the global workplace where leadership, learning, and teaching skills are highly valued. The specific needs of learners should be clearly identified. Learners should have clear, specific and achievable learning goals/objectives based on their specific needs. Learners should be provided with opportunities to teach what they learn to others in order to both deepen their learning experience and demonstrate their proficiency. Needs analysis – What does the student need/desire to learn? Learning objectives – What are the specific learning objectives? Resources – What resources are available to the student to achieve the learning objectives within a specific timeframe of his or her choosing? Performance – What opportunities are available to the student to demonstrate what has been learned? The materials used to conduct the needs analysis can come from a variety of sources, and it is proposed that the student complete the needs analysis independently to the extent possible prior to a meeting with a learning advisor. If a student is interested in learning business English and/or business content in connection with a future job, the student could complete a chart to determine the industry in which the student is interested. To increase the student’s awareness of what a subject (e.g., customer service) entails for the purpose of identifying learning objectives. 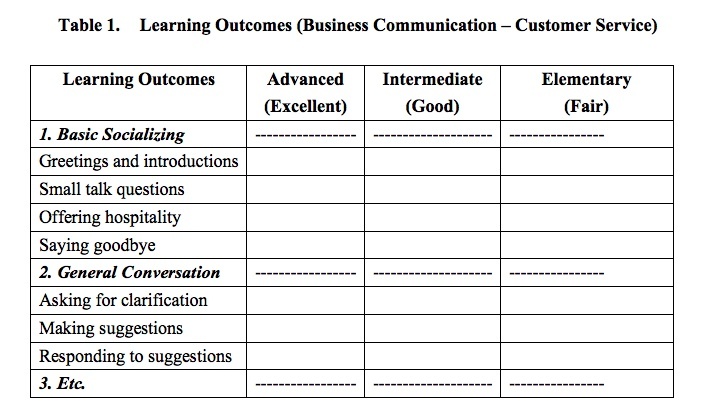 To confirm the desired learning outcomes of the student (although it is recommended that the actual learning outcomes be more clearly and specifically stated than they are in the chart). To confirm the degree of proficiency that the student desires to obtain. 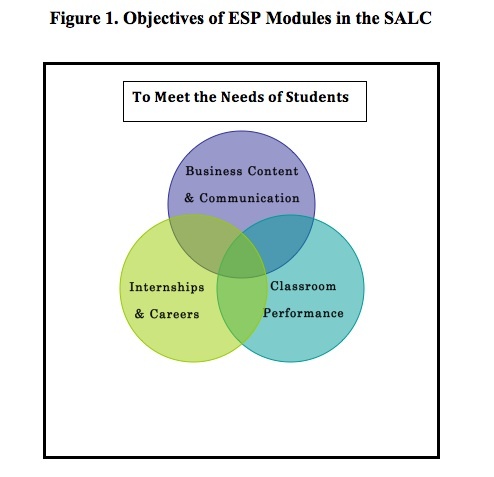 It is proposed that learning resources in the context of ESP modules be defined as those resources that can be used by the student to learn the content and/or communication skills needed to achieve the learning objectives and specific outcomes. From this perspective, learning resources include materials, human resources, and facilities. It is therefore suggested that the learning advisor help the student to create the best “learning resource mix” (Figure 3). 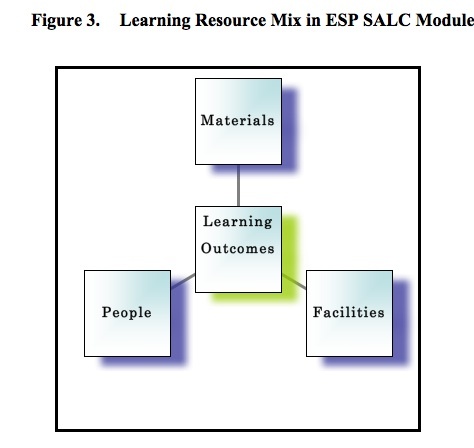 It is suggested that these types of materials also be made available to students taking the ESP modules and that students be assisted by the learning advisor to access these materials in accordance with their needs and learning outcomes. Moreover, it is proposed that the learning advisor become familiar with business-related materials in order to help a student to locate authentic texts such as the online tutorial on financial statements offered by the City University of New York (CUNY) at Baruch College (http://www.baruch.cuny.edu/tutorials/statements/). 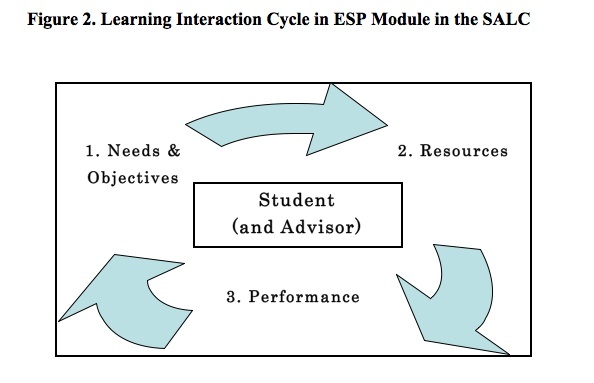 In the proposed ESP module, learning outcomes are drafted by the student (with the possible assistance of the learning advisor), so it is recommended that the student’s performance be assessed in regard to those learning outcomes. A dialog (e.g., between a flight attendant and a passenger) written by the student. A lesson or training session (e.g., in which the student teaches and/or performs what a flight attendant should say and do). A role play (e.g., in which the student takes the role of the flight attendant) video recorded or performed live. In conclusion, the main aim of the ESP module is to promote learner autonomy while at the same time providing various types of support to meet the learner’s specific, identified needs and objectives. The modules supplement and build on classroom work through individualized learning opportunities that address the needs of students that cannot always be met in the classroom. Kevin Knight develops curriculum and teaches in the Career Education Center and the Department of International Communication of KUIS. After completing graduate degrees in Pacific International Affairs (MPIA) and Business Administration (MBA) in the United States, he is pursuing a PhD in Linguistics (Professional Communication) with a focus on leadership at Macquarie University in Australia. Cooker, L. (2008). Some self-access principles. Independence, 43, 20-21. Falchikov, N. (2001). Learning together: Peer tutoring in higher education. London, UK: RoutledgeFalmer. Good, T.L., & Brophy, J. (1995). Contemporary educational psychology. White Plains, NY: Longman. Mynard, J., & Navarro, D. (2010). Japan Association of Self-Access Learning Forum: Dialogue in self-access learning. In A. M. Stoke (Ed. 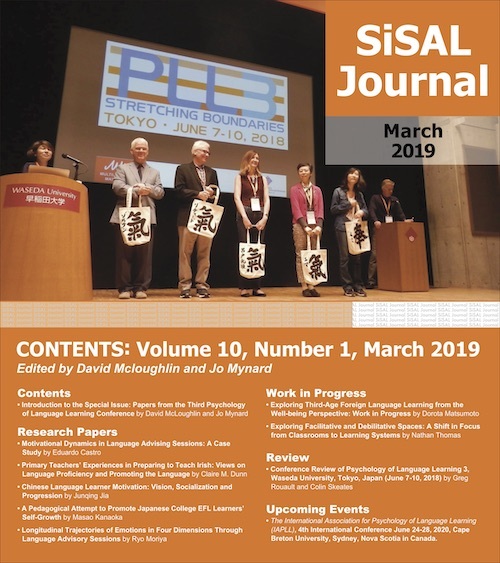 ), JALT 2009 Conference Proceedings. Tokyo: JALT. Noguchi, J., & McCarthy, T. (2010). Reflective self-study: Fostering learner autonomy. In A. M. Stoke (Ed. ), JALT2009Conference Proceedings. Tokyo: JALT. Richey, R. (2010). English for customer care. Oxford, UK: Oxford University Press.